“Derrick’s going to play to win,” added USA assistant and Bulls coach Tom Thibodeau. “Whatever we ask him to do, that’s what he’s going to do. If we asked him to take 20 shots, he’d do that. But we’re not asking him to do that. Because of who he is, he’s closely watched on every play: ‘He did this.’ Every shot is measured, every play is measured. You guys who have followed his career (know) in high school he didn’t shoot a lot and they won big, college (didn’t shoot a lot), won big. Since he’s been with the Bulls, he’s had to score more and he’s done that. But he’s won big. That’s who he is. Winning is important to him. It’s the paradox regarding Rose not only because of the two knee surgeries he’s had, but also the discussion about whether Rose can and will be the player he once was. Perhaps it’s not necessary and won’t be because the Bulls are coming into this season with the best roster around Rose. Gasol and Joakim Noah are All-Star centers and among the best big men in the NBA. Taj Gibson is one of the league’s top sxith men and with the addition of shooting big man Nikola Mirotic from Europe, the Bulls have arguably the best and most skilled front line in the NBA. There’s also rookie Doug McDermott, one of college’s top shooters to go along with high level defender Jimmy Butler and three-point shooting threat Mike Dunleavy Jr. New backup point guard Aaron Brooks averaged 19.6 per game just a few seasons ago. Will Rose sparkle as brightly as the rose-hued cistus, a flower that grows wild here with bright pink pedals? Will his moves be as saucy as the popular sofregit, a Catalan recipe that goes back to the 14th century in bringing various tastes together because of its rare richness? This USA Basketball team could also be an appropriate incubator for a mature basketball player needed less to enhance himself than his teammates. It’s the role Rose is playing here as the USA, as expected, was an easy winner in its opening game of the elimination round of 16. Stephen Curry broke out of an early tournament shooting slump with six of nine threes and a team high 20 points. Teammate Klay Thompson added 15, though the shots are more difficult for this team as the guards other than Rose tend to dominate the ball with one-on-one play and scoring drives. Curry and Rose led with four assists each, though Curry played 10 more minutes. Mexico big man Gustavo Ayon, a free agent who played with Atlanta last season, had 25 points and eight rebounds, another reminder of the potential issues for the USA if it were to meet a big team like Spain for the title. That would be next week in Madrid. The USA needs to win Tuesday and Thursday to reach the finals. For Rose, it would say Saturday’s game was a poor one with a box score of zero for five shooting with those four assists, three turnovers, two rebounds and a steal. He and DeMar DeRozan were scoreless, though starting point guard Kyrie Irving was also quiet with four points and two turnovers in about nine more minutes than Rose. In fact, as this game breezed along with the USA leading 23-13 after one quarter and 42-27 at halftime without many time outs, Rose played four minutes in the first half. By the time he returned in the second half, the USA led 55-30 after that run of early third quarter Curry threes broke open the game. Not that you don’t take any game seriously, but for Rose there also are other priorities that Thibodeau reminds him about on the bench: Move the ball, finish your defense, pressure the ball. Got any lozenges? Rose was short on a jumper when he first came in the game. He then had a drive blocked, recovered the ball and went back up and missed, two thirds of his first half field goal attempts in one possession. Rose had that steal and a few deflections that led to turnovers later. But he also went wide left on a fourth quarter three and almost put in one of those highlight shots with a crossover scoop that missed high off the backboard. “Usually when I come in, we have such a big lead, it’s almost like an All-Star game where I’m coming in and just getting guys into a rhythm,” said Rose, though not trying to make an excuse. “If you look into the past, I never score big in any All-Star game starting from grammar school, high school to college to the NBA. That’s just not my type of game. I’m usually more comfortable with a set team. But being here is great. It’s getting me a chance to really get in condition and get in that rhythm I’ve been talking about. When you’re up 20-25 points, I know then that the game is a little over and I can just facilitate and get guys in rhythm. It’s also that check-your-ego-at-the-door USA Basketball thing that they’re only in it to win it. 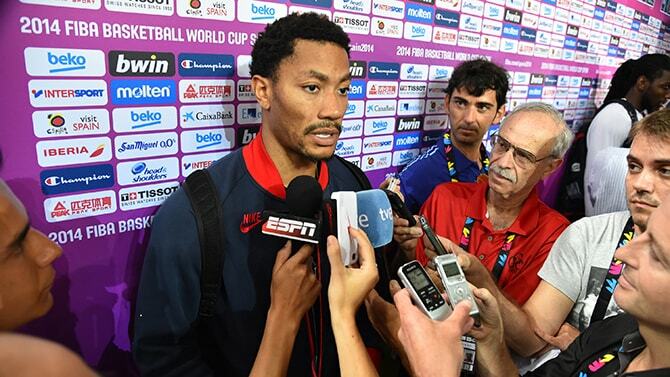 “I think this is the first game I didn’t score,” Rose noted. “I’m laughing about it (to myself). But at the same time, I know I’m getting better in every workout and getting the most out of every day with recovery. We’re winning. Coach K came in at halftime and gave us a good talk about how rusty we were playing (with mostly one-on-one play again to start). We played great in the second half. Me towards the end of the second half, just trying to push the ball up the court and really get guys open shots. He put me back in just to get more rhythm and more time and I appreciate him for that. “Coming here is kind of like a business trip for me,” said Rose, who said he has his mother and brothers with him and mostly has stayed in the team hotel. “I’ve been reading a lot. Just been eating well and doing a lot of recovery stuff, ice baths and really staying off my feet. I didn’t even bring my son here because I’m trying to focus in a little more. Of course I want to enjoy the city. But recovery is my biggest issue because we play a lot of games and the way that I’m playing, I have to get a lot of rest. I’m going to come back one day to enjoy it all, but while I’m here this is a business trip. Of course, that’s also the mantra heard from every coach. Thibodeau isn’t dismissing the Rose as MVP type player. But he insists the way Rose is playing in this USA circumstance is the best thing for Rose in returning to high level form with the Bulls. It’s instead of the hysterical buildup from last season a more modulated approach away from most media and with a team that places less pressure on Rose. It is possible Rose would return to the health he had before his knee surgeries yet not produce anywhere near the statistics he once did for the Bulls. Which is another reason why Thibodeau likes Rose in this environment, a classic structure like the Palau Guell in central Barcelona, a subtle classic. “The big thing with Derrick is each day keep improving,” said Thibodeau. “Physically, I think he’s fine; he’s moving with great speed and explosiveness. His shots aren’t going down right now. Just keep building; we anticipated this. When you’ve been off as long as he has, it’s going to take a little bit to time to get into a rhythm again. He just has to continue to be patient, putting the work into each and every day. The more he plays the better he’ll get. When you have a team as talented as we (USA) have, they are all playing different roles. We are asking all of them to sacrifice for the team, put the team first. Whatever role you’re being asked to play, embrace that role and star in that role. And our guys have done that. So for Derrick right now it’s play great defense, run the team, keep us organized, play hard on every possession. He’s doing that.